This is the third post in the J.W. Selker Series. The series will be focused on Joseph William Selker's return trip to Germany in 1906. This would be Joseph William's first and only trip to Germany after departing 21 years prior. On July 3, 1906 Joseph William Selker arrived at the Port of New York with his traveling party. The crossing took eight days. Upon arrival the group was processed at Ellis Island. Joseph William Selker made the trip to Germany with his nine year old son, Frederick William Selker. The two additional members of Joseph William's party were his nieces. Johanna Anna Selker and Philomena Selker made the decision to leave Germany and relocate to Pennsylvania with their uncle. 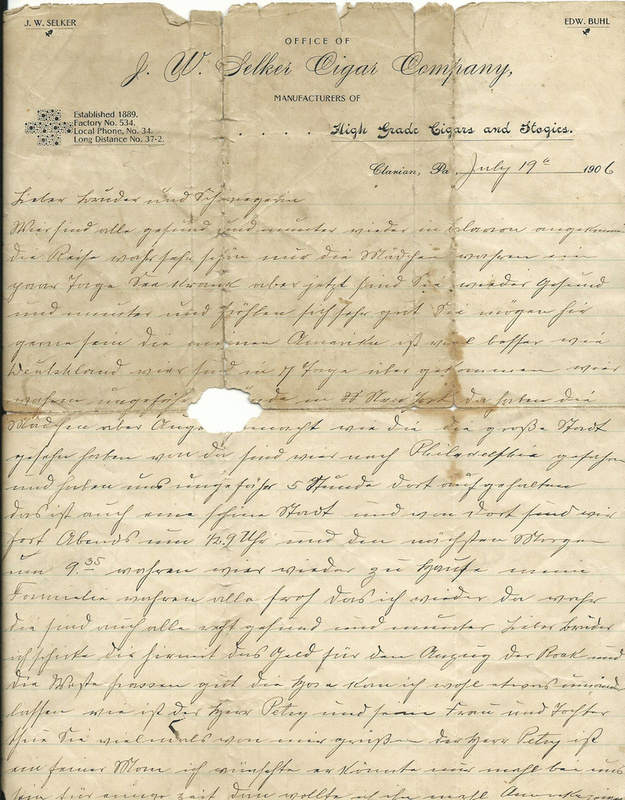 On July 19, 1906 Joseph William Selker started writing a letter to his brother Karl Friedrich Selker. By this time the traveling party had arrived in Clarion, Clarion County, Pennsylvania. Joseph William was reminiscing the trip to Germany and wrote the letter over several days. The letter is written on the letterhead of Joseph William Selker's business - J.W. Selker Cigar Company. The original letter is written in German. The original copy of the letter is over 110 years old. To have the letter translated to English I reached out to Ute Brandenburg the owner of German Script Experts. Ute Brandenburg specializes in German translations. In addition to German translations she also has experience reading and translating old German Script. Ute provides an excellent service to those interested in having German records translated. We have returned to Clarion in good health and spirits. The journey was pleasant, except for a few days when the girls were seasick. But now they are feeling well again and enjoying themselves. They are happy here and say that America is much better than Germany. We arrived after seven days at sea and were in New York for about [word missing]. The girls were very impressed when they saw the big city. From there, we continued on to Philadelphia, where we stayed for about five hours. It is also a very nice city. We left from there at 8:30 in the evening and arrived at home at 9:35 the following morning. Everyone in my family was glad that I was back home. They are also all doing well. Dear Brother, I am sending you the money for the suit. The coat and vest fit well. The pants I can have altered. How are Mr. Petry, his wife and daughter? Please send my regards to Mr. Petry; he is a fine man and I wish he could spend some time with us some day, then I would show him America. Dear Brother, I am sorry that we can’t see each other more often. The journey is too far and takes too long. I do hope to return to Germany in five years, when my oldest son is 20 years old. Then he will be old enough to be in charge of the business, and I can take more time for my visit. I would want to stay all summer. So in five years we will meet again, God willing. Johanna says America is much better than Germany. She will become round and strong, and so will Wilhelmine, who also says she likes it here. They could have found employment by now, but I told them to take it easy and rest for a while, they can work for long enough later. Please send my regards to the Hämmerlein Family. Dear Brother, I just received a letter from Germany with the news that Uncle [missing word] in Bentheim has died. He was 68 years old. He followed our father rather quickly; I am glad I still was able to see him. Otherwise I don’t have much news. Business is slow. There are strikes everywhere so these are not good times. I hope you are doing well. I will close now. Please write soon. You will have received the letter from Johanna by now. It is remarkable that that the original version of the letter survived - after crossing the Atlantic Ocean twice. When researching ancestors we often find records. If we are fortunate we occasionally find photographs of our ancestors. Using those sources we start to learn about the lives of our ancestors and we may know what they look like. It is extremely rare to have copy of an original letter written by an ancestor that dates from the turn of the century. This letter offers a human perspective - especially to a larger than life personality like Joseph William Selker. It show that J.W. the entrepreneur and J.W. the business man was experiencing a range of emotions after his trip. Emotions that we can all relate to - joy and sadness. The letter shows that although the brothers were separated for twenty-one years - they maintained their connection and cared deeply for each other. Gerhardt and Karl Friedrich Selker entrusted J.W. with their daughters. Both brothers had to know there was a strong possibility they would never see their daughters again. While traveling J.W. made an effort to support his brother's business. He bought a suit from Karl Friedrich Selker's tailor shop in Montabaur, Germany. Every time J.W. wore that suit - he likely though of his brother. J.W. focuses on reassuring Karl Friedrich that his daughter Johanna Anna Selker is adjusting to Pennsylvania and doing well. The reader can also sense that J.W. is melancholy as he comments on the great distance between them. Upon his return to Clarion, J.W. was already considering how he could plan a longer return trip to Germany. Unfortunately the return trip to Germany never took place. The growing unrest in Europe leading up to World War I was likely a factor. The translator, Ute Brandenburg, also indicated that the letter was well written - showing that J.W. was well educated. When Philip Franz Selker, the son of Karl Friedrich Selker, departed Germany in 1929 for the United States - his father gave him this letter. In time Philip would become acquainted with Leopold George Selker, his 1st cousin 2x removed. Leopold is a great-grandson of J.W. Selker. Philip eventually gave the original copy letter to Leopold. To learn more about Philip visit the post Philip Selker - Battle of Normandy Veteran. We are very fortunate that this letter survived. The letter obviously had sentimental value to the family as it was passed from father, to son and then to a great-grandson of J.W. Selker. Although a century has passed since the letter was written - the reader gets a rare glimpse of who J.W. Selker was. The original images of this letter are shared with permission. The original version is in the care of Leopold George Selker my 2nd cousin 1x. He is a descendant of Leopold George Selker, Sr. the oldest son of Joseph William Selker and Frances Philomena Guth. From the Leopold George Selker Collection. Expenses for German translation paid for by Michelle M. Murosky. The review of the Ute Brandenburg the owner of German Script Experts was done at my discretion. Our Ancestors - The Murosky & McDonald Ancestral Lines did not receive any compensation for providing a review of services. Editing and digital restoration by Michelle M. Murosky. Joseph William Selker is my 2nd great grandfather. Karl Friedrich Selker is my 3rd great uncle. Johanna Anna Selker and Philomena Selker are my 1st cousins 3x removed. Philip Franz Selker is my 1st cousin 3x removed. Handwritten Letter from Joseph William Selker to Karl Friedrich Selker dated 19 July 1906.